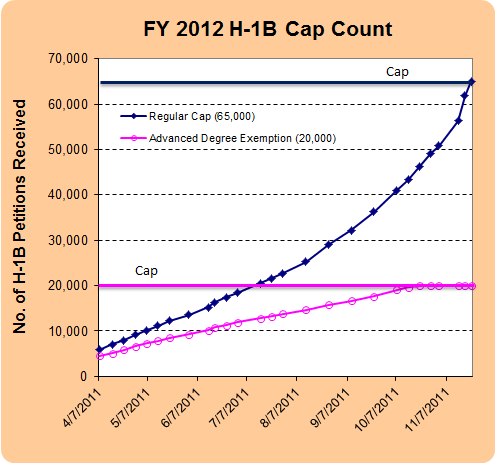 In the table below you will find a log of all FY2012 H-1B cap counts. By keeping a log, and updating it with every new count released by USCIS, we can document the progress of H-1B visa usage. USCIS began accepting H-1B petitions on April 1, 2011. If approved, beneficiaries of these petitions may start working in H-1B status on or after October 1, 2011 – the first day of FY 2012 cap season. The following table includes every cap count released by USCIS. The table will be updated on a regular basis to show the pattern of this year’s H1B filing.